Due to its open nature of its development, Open Babel contains code contributed by a wide variety of developers (see Thanks). This section describes some general guidelines and “best practices” for code developers. To download and update the latest version of the Open Babel source code, you need Subversion. Subversion (or SVN) is the name of the project used to maintain the Open Babel version control repository. There are many clients for Subversion, including command-line and GUI applications (for example, on Windows, TortoiseSVN). For more links, see the Subversion website. There’s also a great book about using Subversion, which is available online. This creates a directory called trunk, which contains the latest source code from Open Babel. Configure and compile this using CMake (see Compiling Open Babel). The following table suggests Subversion commands useful for Open Babel contributors. More documentation can be found in the Official SVN Manual. In the following examples, repo should be replaced by the full URL to the Open Babel subversion repository (https://openbabel.svn.sourceforge.net/svnroot/openbabel/openbabel). We’re human – it’s much easier to understand exactly what a patch is doing if it’s not trying to add 20 features or fix 20 bugs at once. (Hopefully there won’t be a need to fix 20 bugs!) If you want to add several features or fix several bugs, break the patch up into one for each request. The faster someone can understand your patch, the faster it will go into the source. Everyone benefits from faster, quality development. In general, if you find that a recent update by another developer has introduced bugs or broken the code, please bring it up with them ASAP. We have a policy of “if you break it, you fix it” to keep the source code repository always in a working state. The User interface, which may be a command line (in main.cpp), a Graphical User Interface(GUI), especially suited to Windows users and novices, or may be part of another program which uses OpenBabel’s input and output facilities. 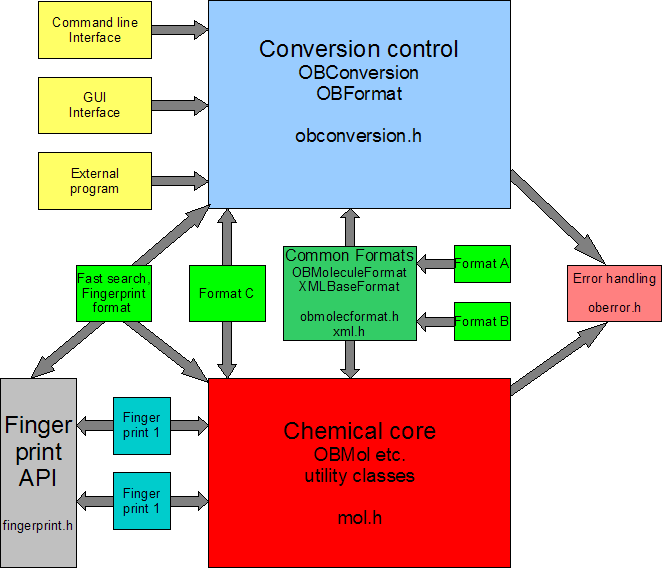 This depends only on the Conversion control module (obconversion.h is included), but not on the Chemical core or on any of the Formats. The Error handling can be used throughout the program to log and display errors and warnings (see below). It is possible to build each box in the diagram as a separate DLL or shared library and the restricted dependencies can help to limit the amount of recompilation. For the formats or the fingerprints built in this way it may be possible to use only those whose DLL or so files are present when the program starts. Several formats or fingerprints may be present in a single dynamic library. Alternatively, and most commonly, the same source code can be built into a single executable. The restricted dependencies still provide easier program maintenance. This segregation means that a module can directly call code only in other modules connected to it by forward arrows. So some discipline is needed when adding new code, and sometimes non-obvious work-arounds are necessary. For instance, since the user interface doesn’t know about the Chemical Core, if it were necessary to set any parameters in it, then this would have to be done through a pseudo format OBAPIInterface. The general philosophy of the Open Babel project is to attempt to gracefully recover from error conditions. Depending on the severity of the error, a message may or may not be sent to the user – users can filter out developer debugging messages and minor errors, but should be notified of significant problems. The operation of Open Babel should be open to developers and users alike to monitor an “audit trail” of operations on files and molecules, and debug the program and library itself when the need arises. A global error handler obErrorLog (an instance of OBMessageHandler) is defined and should be used as shown in the API documentation for the OBMessageHandler class. The OBMol::BeginModify() and OBMol::EndModify() calls are part of Open Babel’s lazy evaluation mechanism. In some cases, code may desire to make a large number of changes to an OBMol object at once. Ideally, this should all happen without triggering unintended perception routines. Therefore, the BeginModify() call marks the beginning of such code, and EndModify() triggers any needed updates of lazy evaluation methods. This code reads in a list of atoms with XYZ coordinates and the atomic number in the first column (vs). Since hundreds or thousands of atoms could be added to a molecule, followed by creating bonds, the code is enclosed in a BeginModify()/EndModify() pair.